. . .d amused each other for a while and played games, you might say. Why, at one point we even had an old crank phonograph going and read some books. And, of course, how when the loot gave out and the fun wore off, we had our murder party and I survived along with, I think, a bugger named Jerry—at any rate, he was gone when the blood stopped spurting, and I'd had no stomach for tracking him, though I probably should have. And in return she could tell me how she had killed off her last set of girlfriends, or boyfriends, or friend, or whatever it was. Who would think that the same guy who wrote those incredibly dull Fahfrd and Grey Mouser books could write such an entertaining and suspenseful tale as this! "Murder, as you must know by now, I can understand and sympathize with deeply. But war? No." The Tale of the Night of the Long Knives by Fritz Leiber is a tale of men and women at the end of the world. (The book was written in 1960 and published in Amazing Science Fiction Stories.) The story takes place in a world remade by Nuclear Holocaust. Interesting science fiction, nuclear apocalypse style. Reminded me so much of fallout 1 and 2 and wasteland that I think they may have been inspired by this story. A scary view of what total destruction could do to a society. What if the denizens of Mel Gibson's film, Mad Max, formed a support group called murderer's anonymous? "Hi, everyone, my name is Mongo." "Thanks, I'm a little nervous, but it's been 12 days since my last murder, no ... wait, sorry, it's been 4 days". t's Fritz Leiber, of course it gets five stars. One two three f o u r five s i x.
Dystopian sci/fi from a master! 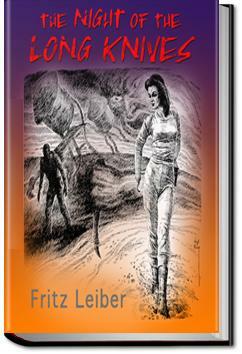 Fritz Leiber was master of fantasy and science fiction. This 1960 novella is a terrific read. In an age where something like "The Walking Dead" is popular it is nice to see how this sort of apocalyptic fiction is handled by a master story teller.